A Reese’s peanut butter cup, a mini cherry pie from Starbucks, delicious chicken pot pie made by my lovely mom for dinner, and chocolate cream birthday pie, with sparkler, made by me! I used this chocolate cream pie recipe, although I cheated and used a pre-made Oreo crust and my own recipe for whipped cream: 1 cup cream, 2 Tbs sugar, 2 tsp vanilla. 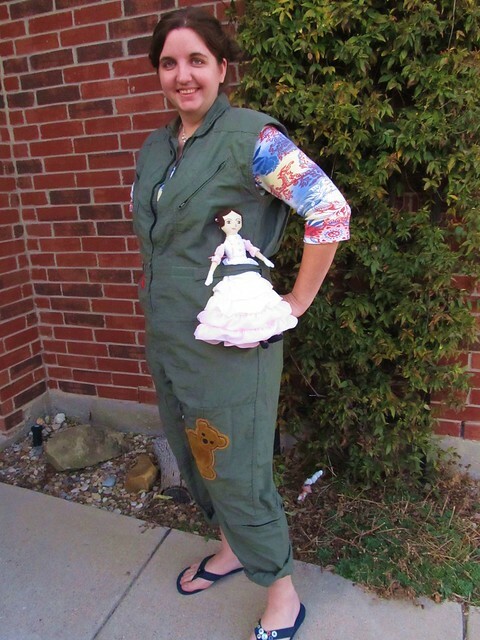 It seems that something about the character Kaylee from Firefly gives me the craft bug–last week I posted about the very first doll I made, which was a Kaylee doll, and a few months ago I posted about my friend Angela’s Firefly birthday party and the Kaylee cake that I made. In the episode her hair is down, but this doll was a Christmas/12th Night present for my friend Angela (yes, the same Angela! 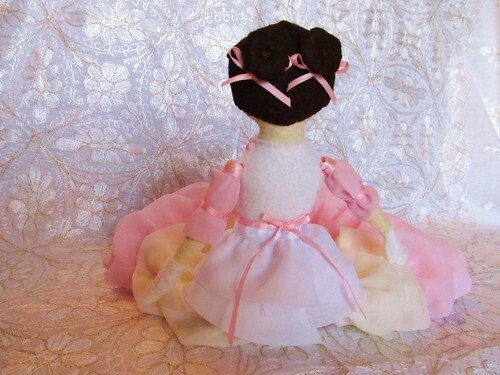 ), and by special request this doll has her hair in buns. 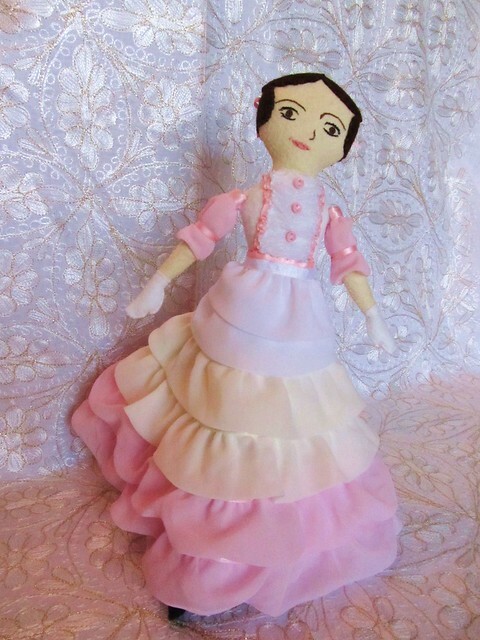 This Kaylee doll is handsewn from felt, ribbons, sheer ruffled trim, and tiny buttons. I based her on Mimi Kirchner’s pattern for The Purl Bee, but I adapted the instructions as I went. 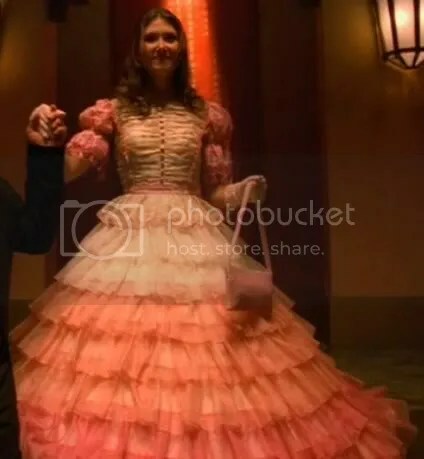 In the Firefly episode it’s never possible to see Kaylee’s feet, so I have no idea what shoes she might have been wearing under her enormous fluffy dress! 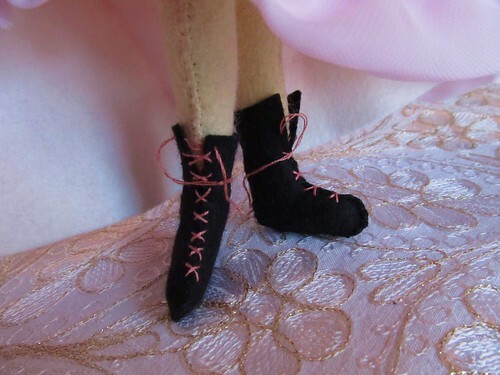 I decided that she’s just the kind of girl who would wear her boots, though, so I made boots with pink laces–and left them untied, because how would you tie your shoes while you’re wearing an enormous fluffy dress? 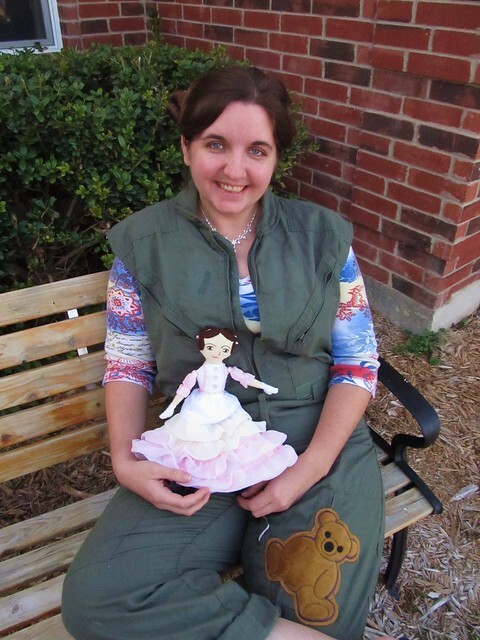 This Kaylee costume actually belongs to my sister, but look! 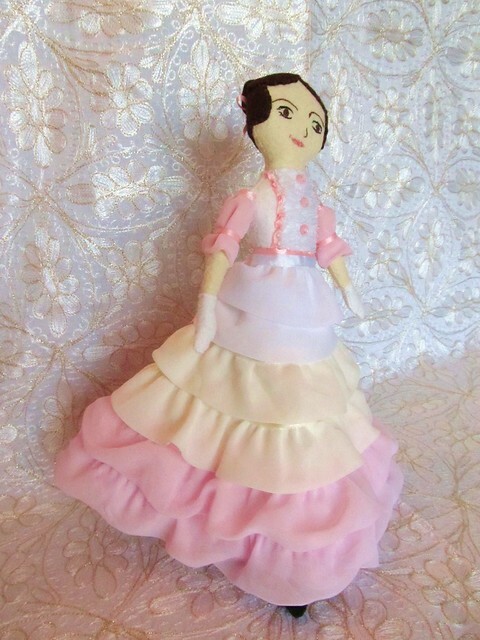 A handy doll carrying strap! 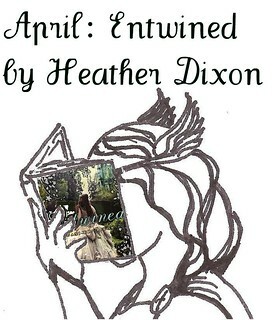 A craft from the archives! 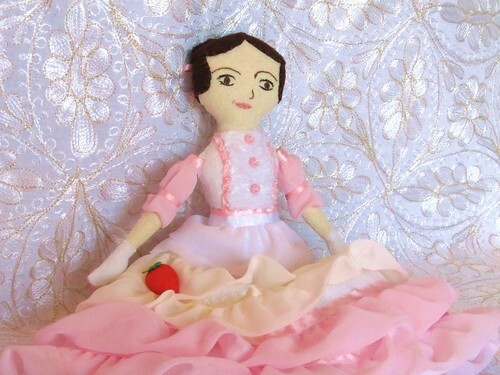 It is, of course, a little plush doll of Kaylee from the TV show Firefly. 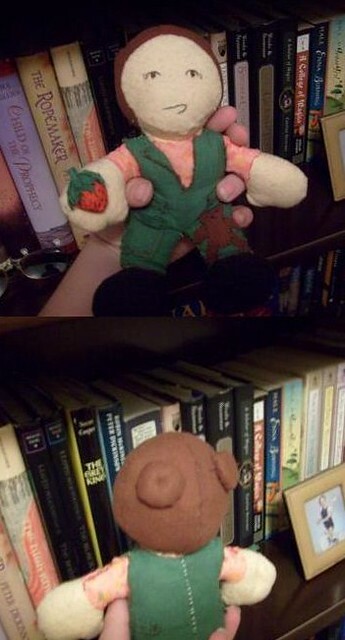 I made this doll four years ago as a gift for a friend of mine, and it was my very first doll making projects. I used a pattern and a tutorial that I found online, but I’ve long since lost the address and I haven’t been able to find it again. I made a huge number of mistakes–I chose fabrics that raveled horribly, like flannel instead of felt (what was I thinking?) and a nylon fabric for the shirt that raveled so badly that I had to singe all of the edges in order to sew it together. I made the entire project so much harder than it needed to be! It was really a huge fumble, from beginning to end, but I was so proud of her, and proud of myself for making her. Anyway. 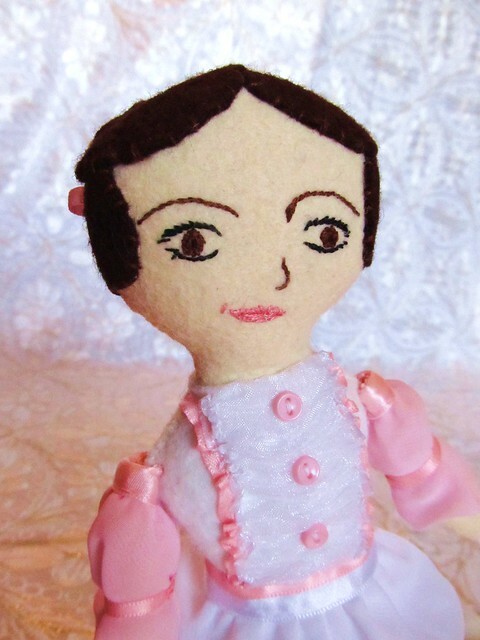 I made this doll. I still think that she’s really cute, and I’m still proud of her–but I’m even more proud of the fact that I can look at this project and know that my skills have improved so much in the last four years, and that if I made this doll again it would be a hundred times better. Perfect I am not, but that leaves plenty of growing room.